Air Deflector - Premium Air Deflector Discounts Apply ! Heat register deflectors are made of a clear durable plastic, which is adjustable. Redirect floor vents away from windows and other drafty areas. Heat register deflectors actually work on both hot and cool forced air systems. 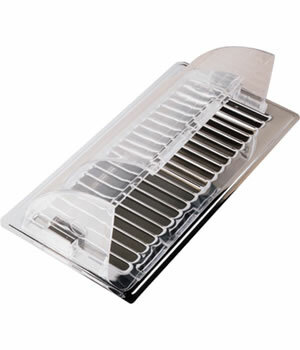 Use these to redirect floor vents towards central areas of your home or office. The premium heat register deflector extends from 10 - 14 inches in length, fitting most floor registers. Easily redirect floor vents and take control over the air flow in your home or office. Air flow deflector installs with magnetic clips and can only be used with metal floor registers. ***Note: The premium heat register deflector cannot be used on radiant heat registers. It is also not compatible with the sleeve extension. If you need to redirect floor vents or even block off registers we have a variety of choices for you to choose from. Heat register deflectors are a great option to redirect floor vents away from windows or drafty areas, order enough for the whole house. Floor Register Resources Response: No, unfortunately, this item is only intended for use with metal floor registers. Please see our other Air Deflector and Accessories options.